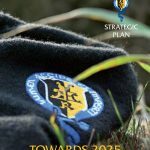 The Rongotai College Strategic Plan is designed to guide the development of our school through to 2025. It has been developed by members of the Board of Trustees in collaboration with all sectors of the school community – students, senior leaders, staff, parents and whanau. The Strategic Plan is built upon our achievement and the distinguishing of the past, and sets a course to best meet the challenges of the future. The focus is on continual improvement in achievement, innovation in teaching and learning, and student and staff well-being.